I was ready to watch my favorite team. Lucky hat on and adjusted, check. Snacks nearby, check. Wait… What’s this? A package addressed to me. I tear open the edge and can’t take my eyes off the cover. It’s an ARC of GRAVE IMAGES that I won recently. Very intriguing. Kickoff is still five minutes away. The pages rustle in my hands, and as much as I want to hear the pregame predictions, the potential of a great story is too strong… The game can wait. 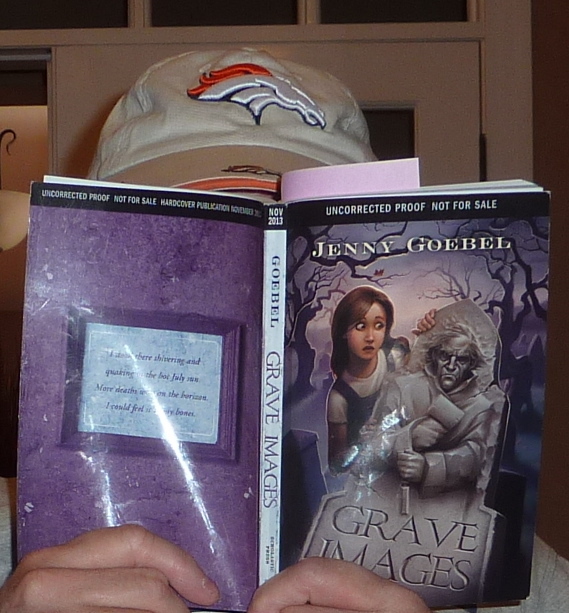 I click “RECORD” and sit back to spend my Sunday reading Jenny Goebel’s new novel, GRAVE IMAGES. WHAT TO EXPECT There’s a strange new visitor to the small town of Stratwood, and he’s taken residence in the guest house at Alpine Monuments. On the property, twelve-year-old Bernie (short for Bernadette) lives there with her father (who etches gravestone markers), and mother, along with, Mimi, her grandmother. Living in a place surrounded by tombstones gives the creepiness a head start, but after Mr. Stein arrives, the creep factor goes up several notches. Seems Mr. Stein is an expert at the craft of gravestone etchings. Sounds innocent enough until Bernie discovers he’s carving headstones of various town residents who are very much alive. Soon after he completes each one, they suddenly drop dead from a heart attack. Thinking that her family would not believe what she feels is the truth, Bernie enlists the help of Michael, a slightly older boy she detests. Together and apart they attempt to unravel a deadly mystery. WHAT I THOUGHT GRAVE IMAGES is a story that makes you want to keep peeking ahead to see if a character’s name is still being mentioned. You don’t know who might be the next victim. The tension builds as clues are discovered. Ms. Goebel skillfully manages the subplots into one satisfying whole. Told from the perspective of Bernie, her strong voice comes through in every scene. You feel the hurt, fear, love, and confusion that Bernie wrestles with in every scene. What a great protagonist. The story is scary but not in a way that will turn off readers, or be too frightful. I passed my copy along to a nine-year-old and he’s enjoying the ride, too. Is it better for girls or boys? Although we have a female lead here, there is also Michael who is pivotal to the story. Boys and girls alike should gravitate to the ghostly happenings. So race right out and get yourself a copy of GRAVE IMAGES. I give it 5 our of 5 Headstones, each etched with a different set of words: SUSPENSEFUL … SCARY …. CREEPY… HARD TO PUT DOWN … PERFECT READ-A-LOUD. 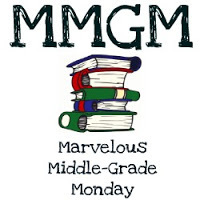 This entry was posted in Reviews and tagged 2013 top middle grade books, Grave Images, Jenny Goebel, Marvelous Middle Grade Monday, Middle grade, scary stories. Bookmark the permalink. “May you R.I.P. (Read it promptly)” — That’s funny, Greg! Thanks for stopping by my blog. I’ve heard a lot of buzz about this book recently but have yet to read it. I often go out of my way to avoid scary books, so I’m glad to hear it’s not too scary. I don’t really like scary/creepy, but a good middle grade mystery is always fun.